The following is the second of a three-part series. The first installation can be found here. The article in full originally appeared in The New Polis in January, 2019. David Morgan was certainly not alone in his disdain for the aboriginal Peoples of this continent, nor, in the final analysis did he perpetrate these particular crimes alone. Moreover, what happened that day in the Monongahela Valley did not happen in a vacuum, but was intrinsically related to events exploding across the territories west of the Alleghenies. The land hunger of the christian invaders, it seemed, could never be quenched, even if it meant killing the current occupants of whatever lands they coveted. By 1779 the colonialist invasion of the Monongahela Valley was just beginning, as the westernmost part of the ever expanding colony of Virginia. The first permanent colonists arrived only as late as 1774—in a flurry of colonial activity. The christian rite of the theft of Indian lands (by “Discovery” and conquest) was still not complete by 1779, giving rise to the need for building fortified retreats spaced through the territory in close enough proximity that colonists could run to their safety whenever the original “owners” of the land sought to contest the christian invasion and occupation. Morgan’s property claim, we are told, was about a mile’s distance from such a fortified retreat. And his “property” was legally secured, in the euro-christian legal discursive practice, by a treaty signed with Indian people, that is, Indian people nearly five hundred miles to the northeast—purporting to sign away land on which other Indian Peoples were living. The american frontier beyond the Alleghenies was a relatively small world in 1779—even as it was a huge territory. The euro-christian invasion was only just beginning, and their settlement enclaves were still quite small. Pittsburgh, for instance, was a village of only a couple hundred people, built adjacent to Ft. Pitt, which had its small military contingent. The military garrison itself was only established in 1758 as a frontier outpost to both mark english “(christian) Discovery” claims to and restrain French aspirations for claiming that large, still heavily Native occupied, territory. Not only were these frontier enclaves small and close-knit, but people on the frontier would have most often known each other, even when separated by considerable mileage. Morgan’s farm was some ninety miles south of Pittsburgh, but connected directly by the Monongahela River. More to the point, frontier settlement quite often involved larger extended families, so that much of the frontier was interrelated. A couple hundred miles south of Morgan was another Quaker-born Indian killer, the famous frontiersman and surveyor Daniel Boone, whose mother was also a Morgan (Sarah). So the two were related, probably as cousins. In the winter of 1788, Boone suffered a disastrous loss of a ginseng harvest in a rafting accident on the river near Morgan’s farm and spent a week boarding with his cousin. Would David Morgan have had acquaintances in Pittsburgh? Indeed, one key colonialist, a continental army officer and settler there, had worked with Morgan ca 1748-50 on that colonialist surveying detachment in the Ohio Valley with the young George Washington and had squatted a farm near Pittsburgh. That old acquaintance, (Col.) William Crawford, would lead a failed invasion of Ohio League territory three years later in 1782 resulting in his death. At the same time, a distant relative, George Morgan, was serving as Indian agent at Ft. Pitt, and they would certainly have been acquaintances. Moreover, David Morgan, as the son of Col. (Rev.) Morgan Morgan, came from a relatively high-status and respected family. Morgan Morgan, a welsh immigrant, came to Delaware with an appointment to the crown council of the colony. He is widely considered the first euro-christian to settle Indian lands in what is today northeastern West Virginia, in Berkeley County, in 1731. By 1734 the area was being flooded with euro-christian immigrants, particularly by a large influx of Quakers, and that same year, Morgan is listed as a founding member of the Hopewell Monthly Meeting of Quakers.All of these relationships become important in describing the racialized socio-political milieu of euro-christian enclave at Rivesville, Virginia Territory. David Morgan and his progeny—like most of their invading christian settler neighbors—certainly considered the Indian peoples of the Virginia frontier to be something less than human, certainly less than themselves. His son, Stephan Morgan, sheriff of Monongalia County called his father’s victims “savages,” although he also records that his father had learned at least three Indian languages, “Delaware, Shawnee, and Wyndotte [sic],” three of the languages of the Ohio Valley League, an alliance engaged in resistance to the further erosion of their Native land base. And we, living with a much greater appreciation for the complexity of these languages (representing two distinct language families) might allow that he may have learned bits and pieces of each. In any case, learning Native languages, especially in the late 18thchristian century, would have required a certain intimacy with those Native communities—belied by his evident hatred and fear of Indian people. In 1763 after the French were defeated both in Europe and in north America, an Algonquin alliance under the leadership of Pontiac responded to the loss of their French allies and the continued threats to their homes by attacking the anglo-christian settlements that were encroaching west of the Allegheny Mountains. Indian resistance forces succeeded in capturing most of the forts with the exception of Fort Pitt. While british military might finally overcame the Native resistance movement, opening western Pennsylvania and even the larger Ohio Valley to euro-christian settler invasion, that victory was thwarted by a nearly simultaneous royal edict from England, the proclamation of 1763. In response to the fierce Native resistance, Britain’s royal proclamation that fall was an attempt to separate the euro-christian settlers from Native Peoples’ communities. It prohibited any settlements west of the Alleghenies and forbade any non-governmental purchase of lands from Native Peoples. It even forbade territorial governors from making land grants in the region. Needless to say, this created a great deal of resentment among euro-christian colonialists on that american frontier, including, no doubt, among land speculators like George Washington. Indeed Washington’s correspondence with a key co-conspirator and land surveyor based in Pittsburgh (a small village already settled west of the Alleghenies), is illustrative.
. . . I can never look upon the Proclamation in any other light (but this I say between ourselves) than as a temporary expedient to quiet the minds of the Indians. It must fall, of course, in a few years, especially when those Indians consent to our occupying those lands. Any person who neglects hunting out good lands, and in some measure marking and distinguishing them for his own, in order to keep others from settling them will never regain it. If you will be at the trouble of seeking out the lands, I will take upon me the part of securing them, as soon as there is a possibility of doing it and will, moreover, be at all the cost and charges surveying and patenting the same . . . . By this time it be easy for you to discover that my plan is to secure a good deal of land. You will consequently come in for a handsome quantity. All of this can be carried on by silent management and can be carried out by you under the guise of hunting game, which you may, I presume, effectually do, at the same time you are in pursuit of land. When this is fully discovered advise me of it, and if there appears a possibility of succeeding, I will have the land surveyed to keep others off and leave the rest to time and my own assiduity. Then only three springs later, Washington joined Crawford, as they teamed up on a land scouting excursion to the Ohio River in the area around Point Pleasant. This was four years before Dunmore’s expedition—which included a company commanded by Crawford—which conquered Native Peoples there and secured the territory for euro-christian occupancy. Washington and Crawford were already looking for suitable investment property—ostensibly locating suitable lands as grants for veterans in Washington’s Virginia Regiment as well as for personal investment. Edward Redmond reports that their joint effort resulted in a 64,071 acre grant, but nearly 30 percent of this grant was patented in Washington’s name as personal property. In this context we should note that by the time of Washington’s death (1799), he still owned 45,000 acres of land west of the Alleghenies, and that not counting the considerable acreage he had sold (at enormous profit) in projects of building frontier towns. It is not insignificant that this is the same William Crawford who would be famously executed by the Ohio League in Hopocan’s Lenape village in 1782, after a disastrous attempted euro-christian attack on the League’s villages on the Sandusky River. This is three years after what Lucullus McWhorter calls “the Morgan-Indian tragedy at Pricket’s Fort,” yet it is not unrelated in interesting ways. Crawford’s execution was widely publicized in the colonial american frontier world, markedly in one particular published report. The editor and publisher of the report is the same editor and publisher, Hugh Henry Brackenridge, who published the April 26, 1779 “letter” about the Morgan affair, having moved in the interim to Pittsburgh. Moreover, as we shall see, Brackenridge was both a provocateur and a practiced liar of the highest order. Brackenridge, a scottish immigrant as a child, was a diehard american patriot who wrote heavily romanticized patriotic poetry and drama. He graduated from Princeton with classmates James Madison and Philip Freneau, taught school briefly, was ordained as a presbyterian minister and served as one of Washington’s chaplains in the Continental Army—preaching fiery patriotic sermons. He went on to read law before settling in Philadelphia and pursuing his interests in publishing. After his publishing venture failed to attract the gentry-elite of the capitol, Brackenridge abandoned Philadelphia for the tiny but what he thought the more wealth-and-fame promising outpost of Pittsburgh, where indeed he did go on to considerable fame and fortune. His accomplishments included starting what became the Pittsburgh Gazette and a school that is today the University of Pittsburgh. A failed politician who served one term in the U.S. congress, Brackenridge went on to become a justice of the Pennsylvania supreme court. An incendiary propagandist for the revolutionary war, Brackenridge was particularly keen on fueling the war on the western front—against Indians. His publishing of the so-called captivity narrative of one of the euro-christian prisoners held with Crawford—but who managed to escape—is a prime example of this political urge. I want to argue that his publishing of the Westmoreland letter recounting the Morgan killing of two Indians four years earlier is of the same propagandistic genre. Brackenridge found in the spectacular death of William Crawford, Washington’s old partner in the land speculation business and a citizen of Westmoreland County, a vehicle for pressing his anti-Indian propagandistic aims. In late May 1782, Crawford led an army of about 500 deep into Ohio Native territory with the intention of surprising and destroying the Ohio League towns on the upper Sandusky River. It was just another piece of Washington’s strategy of fighting the revolution on two fronts: one against the English in the east; the other against Native Peoples in the Ohio Valley, the so-called western front. Ultimately, the League got notice of the attack and were well prepared to intercept Crawford and his army, defeating them handily. While a great many of Crawford’s men managed to escape during the rout, a contingent including Crawford were captured and taken to the main Lenape town. Crawford was executed following a day-long trial before one of the key governing councils (i.e., the women’s council) of the town. One of those captured with Crawford, the regiment’s surgeon, Dr. John Knight, did manage to escape and make his way back towards Pittsburgh, where he functioned as an eyewitness to Crawford’s death, but his is only one of many eyewitness testimonies, both Indian and euro-christian. Brackenridge almost immediately imposed himself on the invalid’s bedside to get his account of the execution of Crawford. Writing less than a month after Knight was found and carried into Fort McIntosh on a blanket, “injured, barely coherent, and starving,” Brackenridge insists that Knight wrote out his own account. We know this to be a falsehood, since as Parker Brown notes Brackenridge himself admitted as much some years later. While Brackenridge’s narrative became the celebrated frontier romance, persistently reprinted and sold out until after the Civil War, there were plentiful other accounts against which Brackenridge’s narrative can be compared. Fortunately, Parker Brown has done some of that task for us. Having devoted considerable publication energies writing about the Crawford incident, Brown is able to surface a number of other early reports on the Crawford execution, several even quoting Knight. By comparing accounts, for instance, he is able to ascertain that Brackenridge has falsified the sequence of events, quite evidently to satisfy his own propaganda needs. Brackenridge spends no energy in exploring why the Natives dealt so harshly with Crawford other than his usual claim that they are a cruel and barbaric race—thus, ignoring the Goschocking (Gnadenhutten) Massacre of only a couple of months prior to Crawford’s military adventure. Knight undoubtedly reported to Brackenridge that Crawford’s trial before the women’s council explicitly made the connection between his sentence and the Genocidal murders at Gnadenhutten, since we have other reports of Knight’s testimony from others. Rather, Brackenridge chose to erase that connection in his published account of Knight. By shifting the sequence of events he avoids having to report either Crawford’s formal trial or the Native reasoning for their execution and works to conceal the connection between the two, leaving his readers with a clear impression of savagery on the part of Native Peoples. It is well documented that Crawford received a trial before being executed, a fact that Brackenridge doggedly erases from his record. On June 10tha council, the Clan Mothers’ Council, in Hopocan’s Lenape town, spent long hours hearing evidence and debating Crawford’s crimes before passing sentence on him. Crawford, in other words, did have a formal hearing, the equivalent of a euro-christian judicial court trial. Reporting this fact would deprive Brackenridge’s narrative of some of its propaganda force. Indeed, Brackenridge has intentionally falsified his telling of Knight’s story to increase its propaganda force! Crawford was taken to this particular town out of explicit deference to the Lenape precisely because of their loss, the genocidal massacre at Gnadenhutten, at the hands of another military foray led out of Pittsburgh only two months prior to the ill-fated Crawford campaign. We should note for starters here, however, that it was Crawford who initiated the most recent military encounter. He led a large army, under orders from a commanding general of the Continental Army, from Pittsburg into the Ohio Valley. This was the remaining homeland of the Ohio League (Seneca, Wendat, Lenape, and Shawnee Peoples), and indeed, this was the third major american colonialist attack on the Lenape inside of four years. It had already firmly convinced the Lenape to abandon their longstanding attempt to remain neutral in the British/American war and forced the Lenape to move ever closer to the other League villages. Of more immediate significance, however, is the historical fact that Crawford’s expedition against the Sandusky towns came so soon after Crawford’s second in command, David Williamson, had perpetrated that vicious Genocide against an american allied Moravian christian Indian village at Gnadenhutten. These pacifist christian Indians were overwhelmingly Lenape, and in spite of their conversion they were still beloved relatives of those Lenape on the upper Sandusky. This accounts for the principled decision to transfer Crawford to Hopocan’s Lenape town for trial and execution. The wounds were still very raw from that euro-christian brutality, from the murder of ninety six of Hopocan’s people—some 28 men, 29 women and 39 children were murdered in cold blood, execution style, by Williamson and his men. Three months later Williamson escaped capture. Crawford was not so lucky and paid the price for Williamson’s indiscretion. The Lenape explicitly made the connection between the Genocide at Gnadenhutten and their trial and execution of Crawford. Brackenridge just as intentionally concealed that connection in order both to inflame his public against Indian folk generally and to help salve the euro-christian conscience by erasing that stain of guilt. Parker Brown is absolutely correct in his analysis here. Indeed, Brackenridge seems to see the death of Crawford as an opportunity to move the attention of the amer-christian public beyond any remorse they might feel for the Gnadenhutten Massacre and to redirect attention to his own project, one of identifying Indian peoples with barbarity as blood thirsty savages. At the same time, it should not pass without notice that this was not Crawford’s first outing in military uniform against Native Peoples on their own land. He had fought in the Ohio valley war of the british against the french, the so-called french and Indian war—as a member of the ill-fated Braddock expedition; fought again in the Pontiac War. He led a virginia regiment early in the revolutionary war, seeing action on that western frontier against Native Peoples. But most memorably for the Native alliance in the Ohio Valley, he had been with Dunmore’s expedition at Point Pleasant in 1774 and led the gratuitous attack that destroyed the undefended Salt Lick Town after the decisive military encounters had virtually ended Indian resistance. This, we will remember, was precisely the territory he and Washington had reconnoitered only a couple of years before as potential investment property. A euro-christian captive of this community, Jonathan Alder, told an account of the attack. Community members remembered and told a terrifying account, of what Andrew Lee Feight insists would be called “a monstrous war crime” today: “…the killing of innocent civilians who ran in panic with their children and grandchildren as the Virginians shot indiscriminately at the villagers.” Alder clearly reports that no armed fighting men were present in the village at the time. Needless to say, Indian Peoples in the Ohio Valley neither forgot nor forgave that criminal act on Crawford’s part. Crawford’s execution was both dramatic and brutal, involving hours of torture. As he walked around the stake to which he was tied, he was shot 96 times with blank loads of powder, one for each of the innocents killed at Gnadenhutten. Brackenridge’s editorial handling of the incident, erasing the Gnadenhutten connection, however, is merely opportune propagandizing, intentionally inciting further terrorist activity on the part of the amer-christian population of western Pennsylvania and of the federal government itself. Because there are other reports that also quote Dr. Knight, we know that Brackenridge persistently falsified Knight’s story, his political and propaganda interests superseding any interest in truth-telling. This brings us back full circle to Brackenridge’s publication of the Westmoreland letter about the David Morgan killings in May 1779, less than a month after the murders had been perpetrated near Rivesville, and raise anew for us the question of the letter’s truth value, since we only have Brackenridge’s published account of the letter and do not have the autograph copy. How much of that letter is the original letter, and how much is heavy-handed editorial emendation from Brackenridge? “The white man is upwards of sixty years of age, his name is David Morgan, a kinsman to col. Morgan of the rifle battalion. This man had through fear of the Indians, fled to a fort about twenty miles above the province line, and near the east side of the Monongahela river. From thence he sent some of his younger children to his plantation, which was about a mile distant, there to do some business in the field. He afterwards thought fit to follow, and see how they fared. Getting to his field and seating himself upon the fence, within view of his children, where they were at work, he espied two Indians making towards them: on which he called to his children to make their escape, for there were Indians. The Indians immediately bent their course towards him. He made the best haste to escape away, that his age and consequent infirmity would permit: but soon found he would be overtaken, which made him think of defense. Being armed with a good rifle, he faced about and found himself under the necessity of running four or five perches towards the Indians, in order to obtain shelter behind a tree of sufficient size. 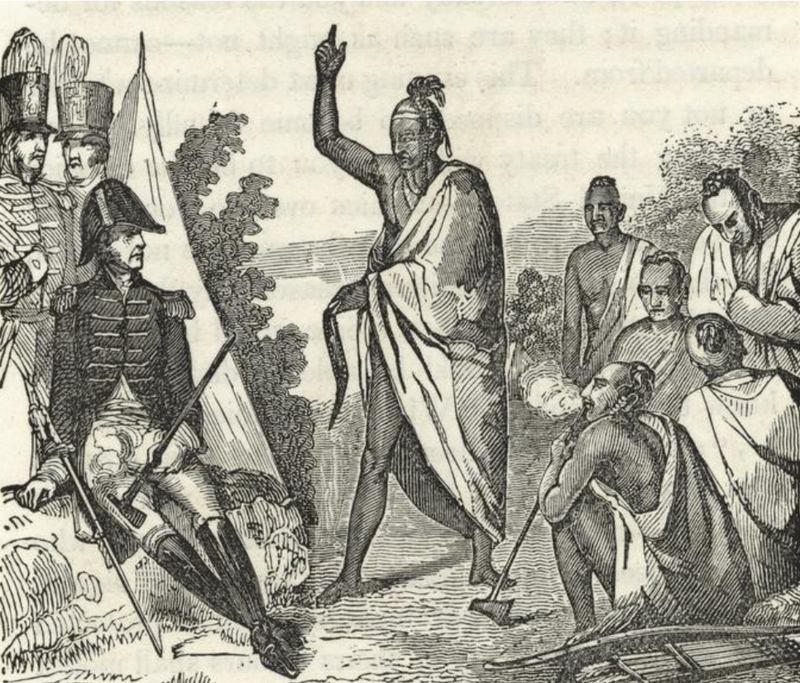 “This unexpected manoeuvre obliged the Indians, who were close by, to stop where they had but small timber to shelter behind, which gave mr. Morgan an opportunity of shooting one of them dead upon the spot. The other, taking advantage of Morgan’s empty gun, advanced upon him and put him to flight a second time, and being lighter of foot than the old man, soon came up within a few paces when he fired at him, but fortunately missed him. On this mr. Morgan faced about again, to try his fortune, and clubbed his firelock. The Indian by this time had got his tomahawk in order for a throw, at which they are very dexterous. Morgan made the blow, and the Indian the throw, almost at the same instant, by which the little finger was cut off Morgan’s left hand, and the one next to it almost off, and his gun broke off by the lock. Now they came to close grips. Morgan put the Indian down, but soon found himself overturned, and the Indian upon him, feeling for his knife, and yelling most hideously, as their manner is when they look upon victory to be certain. 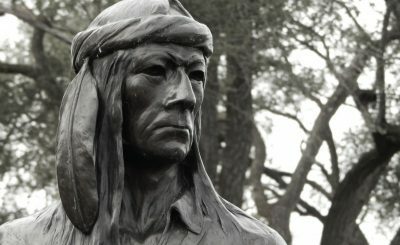 However, a woman’s apron which the Indians had plundered out of a house in the neighborhood, and tied on him, above his knife, was now in his way, and so hindered him getting at it quickly, that Morgan got one of his fingers fast in his mouth and deprived him of the use of that hand, by holding it; and disconcerting him by chewing it; all the while observing how he would come on with his knife. At length the Indian had got hold of his knife but so far towards the blade that Morgan got a small hold of the hinder end; and as the Indian pulled it out of the scabbard, Morgan giving his finger a severe screw with his teeth, twitched it out through his hand, cutting it most grievously. By this time they had both got partly on their feet, and the Indian was endeavouring [sic.] to disengage himself; but Morgan held fast by the finger, and quickly applied the point of the knife to the side of its savage owner; a bone happening in the way, preventing its penetrating any great depth, but a second blow directed more towards the belly, found free passage into his bowels. The old man turned the point upwards, made a large wound, burying the knife therein, and so took his departure instantly to the fort, with news of his adventure. Tink Tinker is Professor Emeritus at Iliff School of Theology. His publications include American Indian Liberation: A Theology of Sovereignty (2008); Spirit and Resistance: Political Theology and American Indian Liberation(2004); and Missionary Conquest: The Gospel and Native American Genocide (1993). He co-authored A Native American Theology (2001); and he is co-editor of Native Voices: American Indian Identity and Resistance (2003), and Fortress Press’ Peoples’ Bible (2008). Note again that the use of original owners is a mere ironic usage of euro-christian colonialist languaging. See note 7 above. The initial treaty was the 1768 Ft. Stanwix Treaty, a treaty with the Six Nations of the eastern Iroquois League. It was intended to resolve conflict with Indian Peoples in what is now western New York, western Pennsylvania, West Virginia, and the Ohio Valley as far south as Kentucky. Strangely enough, the immediate conflict had been the resistance movement of an alliance in the northwest, under the leadership of the Odawa leader Pontiac. Most importantly, the Shawnee did not agree to the land cessions of this treaty and maintained their Native possession until Dunmore’s victory at Point Pleasant (on the Ohio River) in 1774 and the ensuing Treaty of Camp Charolette. But even this treaty found a great many Indian communities dissenting—and choosing to re-engage resistance after the beginning of the 1776 war. See especially, Ward Churchill,Struggle for the Land: Native North American Resistance to Genocide, Ecocide and Colonization:Indigenous Resistance to Genocide, Ecocide and Expropriation in Contemporary North America (Common Courage Press, 1993); and Barbara Alice Mann, George Washington’s War against Native America. Barbara Miller, “Pittsburgh Was Once Part of Washington County, But There Are Stranger stories….” Observer-Reporter, May 9, 2017. On-line at: http://www.observer-reporter.com/20160709/pittsburgh_was_once_part_of_washington_county_but_there_are_stranger_stories. By 1790, following the american war victory over english colonial occupation, Pittsburgh had grown exponentially to about 1800 people. See: http://us-census.org/pub/usgenweb/census/pa/allegheny/1790/. And by 1790, Pittsburgh was increasingly safe from further actions of Native resistance to the theft of their lands. Some insist that Sarah Morgan was David’s sister and that Daniel Boone was thus David’s nephew. Daniel (1734-1820) would have been only thirteen years younger than David Morgan (1721-1813). Sarah Morgan would have to have been considerably older than David were they actually siblings; yet Morgan Morgan’s first child was born in 1715. Sarah would have been, at best, 19 then, but no Sarah is listed among Morgan Morgan’s offspring.????? Glenn Lough, Now and Long Ago, 654. Lough traces several oral traditions of the Boone mishap, finally arguing for what he finds the most convincing scenario. On Morgan’s involvement with this survey crew, see: James Morton Callahan, Genealogical and Personal History of the Upper Monongahela Valley West Virginia, under the Editorial Supervision of Bernard Butcher: With an Account of the Resources and Industries of the Upper Monongahela Valley and the Tributary Region, Volume 3. (Lewis Historical Publishing Company, 1912), 55. For Crawford’s early and long relationship with Washington, see Consul Willshire Butterfield, An Historical Account of the Expedition against Sandusky under Col. William Crawford in 1782 (Cincinnati: R. Clarke, 1873), 81ff. And note the extensive Washington-Crawford correspondence cited below. Like David Morgan, George was a second generation immigrant whose parents made the journey from Wales. Both families were undoubtedly from Glamorganshire, where the Morgan name was common. Glamorgan was the administrative seat of governance for Wales and was far and away the most prosperous and most populous county in Wales. Figuring out the connection between these two families would be a research project unto itself, but surely the two would have become acquainted during George’s tenure at Ft. Pitt. .
Hinshaw, Encyclopedia of American Quaker Genealogy. Vol. vi, p. 357. Interview with Stephen Morgan, Monongalia Gazette; also cited in Glenn Lough, Now and Long Ago, 521f. Known as the Royal Proclamation of 1763, the order was issued October 7, 1763, by George iii, king of England immediately following the english victory over France in what is known as the Seven Years War (or colloquially in the U.S. as the French and Indian War). George Washington to William Crawford, September 21, 1767, George Washington Papers, Manuscript Division, Library of Congress: George Washington Papers at the Library of Congress, 1741-1799: Series 5 Financial Papers: George Washington to William Crawford, September 21, 1767, Account Book 2. A facsimile of the autography is available on-line at: http://www.memory.loc.gov/cgi-bin/ampage?collId=mgw5&fileName=gwpage004.db&recNum=13. A transcription is available at: https://founders.archives.gov/documents/Washington/02-08-02-0020. Also see C. W. Butterfield, The Washington-Crawford Letters, Being the Correspondence between George Washington and William Crawford, 1767-1781, Concerning Western Lands (Cincinnati: R. Clarke & Co., 1877), 1-5. This is a collection of all known correspondence between Washington and both Crawford and his brother Valentine Crawford and demonstrates their close bond of friendship and business. For a clearheaded modern analysis, see: Edward Redmond, “Washington as Land Speculator,” George Washington Papers, Articles and Essays, Library of Congress, online at: https://www.loc.gov/collections/george-washington-papers/articles-and-essays/george-washington-survey-and-mapmaker/washington-as-land-speculator/. For Washington’s daily journal of this land-grabbing excursion, see: “Journal of George Washington Witten during an Expedition along the Ohio and Kanawha Rivers,” in The Writings of George Washington, Jared Sparks, ed., Volume II (Boston: Charles Tappan, 1846), pages 516-534, On-line at: http://www.wvculture.org/history//settlement/washingtonjournal1770.html. Hugh Henry Brackenridge, ed., Indian Atrocities: Narratives of the Perils and Sufferings of Dr. Knight and John Slover during the Revolutionary War with Short Memories of Col. Crawford and John Slover and a Letter from H. Brackenridge, on the Rights of the Indians, etc. The book was widely published and was still being published some 85 years later. The edition I am citing from is: Cincinnati: U.P. James Publishers (reprinted from the Nashville edition, 1843), 1867. Although the Shawnees had quartered Colonel Harrison and left his parts rotting on a pole, his death was not sufficiently horrifying to the settlers, who were hardened to the practice of drawing and quartering, a European torture visited on their own unfortunate citizens as public spectacle. 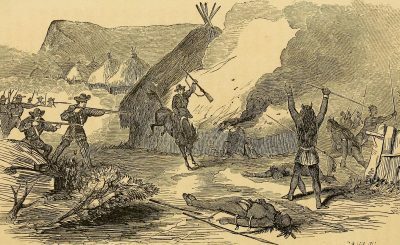 The other fifty to seventy men missing or captured—nine of whom were known to have been killed and scalped—were as nothing. Harrison et al. were surplus suffering, quickly forgotten, as Crawford’s name was emblazoned across the broadsides. It was Crawford, Crawford, Crawford, his story told and retold, first in the settler press, and later in settler histories for the next century and a half, always as emblematic of Native subhumanity, but never in the context of[the March 1772 genocide at] Gnadenhutten. Mann, 174. Anonymous, “Remarkable Encounter of a white Man with two Indians. In a Letter to a Gentleman of this City [i.e., Philadelphia].” The United States Magazine, May, 1779, Hugh Henry Brackenridge, ed., printed and sold by F. Bailey. Pp. 210-212. Parker B. Brown, “The Historical Accuracy of the Captivity Narrative of Doctor John Knight,” Western Pennsylvania Historical Magazine70 (January 1987): 53. Here Brown would have done well to read (anachronistically, albeit) Barbara Mann’s entry, “Girty, Simon (Katepakomen) (Seneca-Wyandot), 1741-1818,” in the Encyclopedia of the Haudenosaunee (Iroquois Confederacy), edited by Mann and Bruce Elliott Johansen (Greenwood Press, 2000), 111-118. Girty is regularly treated as something of an american race-traitor, a man who in a pique turned from an american patriot to an english spy. Mann corrects the regular amer-christian misrepresentation of fact: Katepakomen (Girty) was Native (despite a euro-christian father); he was indeed the Wyandot War Chief of Ohio during the revolution, not some reprehensible White turncoat. Parker at least tries to rescue his reputation by calling him a british agent, but this too belies the truth. Brown reports that “several detailed communications quoting Knight were on their way east within a month after Knight’s return” (56), which Brown goes on to list. Butterfield, Washington-Irvine Correspondence, 249-50, 126f., and 376f. ; Croghan manuscript letter, Indiana Historical Society, Indianapolis; William P. Palmer, Calendar of Virginia State Papers and Other Manuscripts (Richmond, 1884), 3:235. That Crawford’s hearing was before the Clan Mothers’ Council emphasizes that this is yet a traditional Indian culture that was matriarchal. See Barbara Mann’s Iroquoian Women: the Gantowisas(Peter Lang, 2000), where Mann demonstrates the standard erasure of women and the feminine in euro-christian reports (e.g., anthropologies) of Native Peoples. She also describes the Clan Mothers’ Council and its work. While accounts of the Gnadenhutten atrocities are plentiful, perhaps the best account historically is that of Barbara Mann, “Goschocking (Ohio) Massacre of 1782,” Encyclopedia of American Indian History, Bruce E. Johansen and Barry M. Pritzker, editors (ABC-CLIO, 2007), 1: 240–43. Andrew Lee Feight, “William Crawford and the Destruction of Salt Lick Town,” http://sciotohistorical.org/items/show/2. Alder’s own story is published by Henry Clay Alder, A History of Jonathan Alder: His Captivity and Life with the Indians(University of Akron Press, 2002). Francis Bailey was the renown Philadelphia printer, an official printer for the new congress as well as for the commonwealth of Pennsylvania. He shared the anti-federalist leanings of Brackenridge, Freneau, and Madison.